The holidays are the season of giving and five Laredo educators are the fortunate recipients of a generous grant that will help pay their college student loan debts thanks to a program established by Carlos Zaffirini, Jr., son of Senator Judith Zaffirini, in honor of his mother. In a reception Friday at Texas A&M International University’s (TAMIU) Senator Judith Zaffirini Student Success Center, Senator Zaffirini announced the 2019 recipients of The Senator Judith Zaffirini Teachers’ College Student Loan Debt Grant. Present were her son, Carlos Zaffirini, Jr., the recipients and their family and friends, community guests, as well as colleagues from TAMIU, Laredo College (LC), Laredo Independent School District (LISD), United Independent School District (UISD), and St. Augustine High School. Dr. Ariadne González, TAMIU assistant professor of Communication; Dr. Antonio Carranza, Laredo College mathematics instructor; Eduardo Valdez, St. Augustine Catholic School Geography teacher; Diana Ramírez, Finley Elementary School Dyslexia teacher; and María del Carmen Gammon, C. L. Milton Elementary School 5th grade teacher. Each will receive $2,000 grants to help pay their college student loan debts. To qualify, teachers must have taught in Laredo for at least five years, have a college student loan debt of at least $5,000, and be selected by his or her institution, based on program criteria. The program was launched in February. Participating are TAMIU, LC, St. Augustine High School, UISD, and LISD. Senator Judith Zaffirini announced the 2019 recipiens of the The Senator Judith Zaffirini Teachers’ College Student Loan Debt Grant. Recipients, seated at the front row, from left to right are: Dr. Antonio Carranza, Diana Ramírez, Eduardo Valdez, Maria del Carmen Gammon and Dr. Ariadne González. Standing back row are: Dr.Thomas Mitchell, TAMIU provost and vice president for Academic Affairs; Dr. Pablo Arenaz, TAMIU president; Judge Victor Villarreal, Webb County Court-at-Law II; Anna B. Galo, Texas Parks and Wildlife commissioner; Senator Judith Zaffirini; Carlos Zaffirini, Jr.; Audrey Zaffirini; Maximiliano Zapata, City of El Cenizo commissioner; and John Galo, Webb County commissioner. Zaffirini said he established the program to honor his mother, who completed three degrees at The University of Texas at Austin thanks to a National Defense Student Loan, and paid it back largely through teacher loan forgiveness programs. 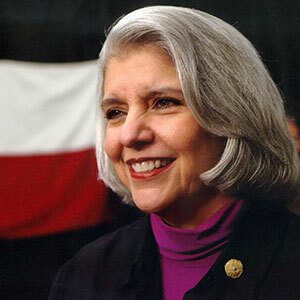 Senator Zaffirini expressed her passion for higher education. Carlos Zaffirini, an attorney, businessperson and philanthropist, is president and CEO of Adelanto Health Care Ventures (AHCV), LLC, a healthcare finance consulting firm. Since 2012, he has honored his mother annually with endowed gifts including scholarships at TAMIU, UT-Austin, and the Baylor College of Medicine; the Access to Justice Initiative at the UT Law School, and a family patient suite at the UT Dell Seton Medical Center. The Teachers’ College Student Debt Grant Program will continue through 2020, and may be extended. Participating institutions select their respective recipients each year. For more information, please contact the TAMIU Office of Public Relations, Marketing and Information Services at 956.326.218-, email prmis@tamiu.edu or visit offices located in the Sue and Radcliffe Killam Library, room 268.